Tsavo east National park is 11,747 Km Sq. Altitude 150 – 1,200 meters above sea level. Tsavo east National park is located in South-West Kenya, inland from the Coast. The tsavo east national park is Warm and dry. 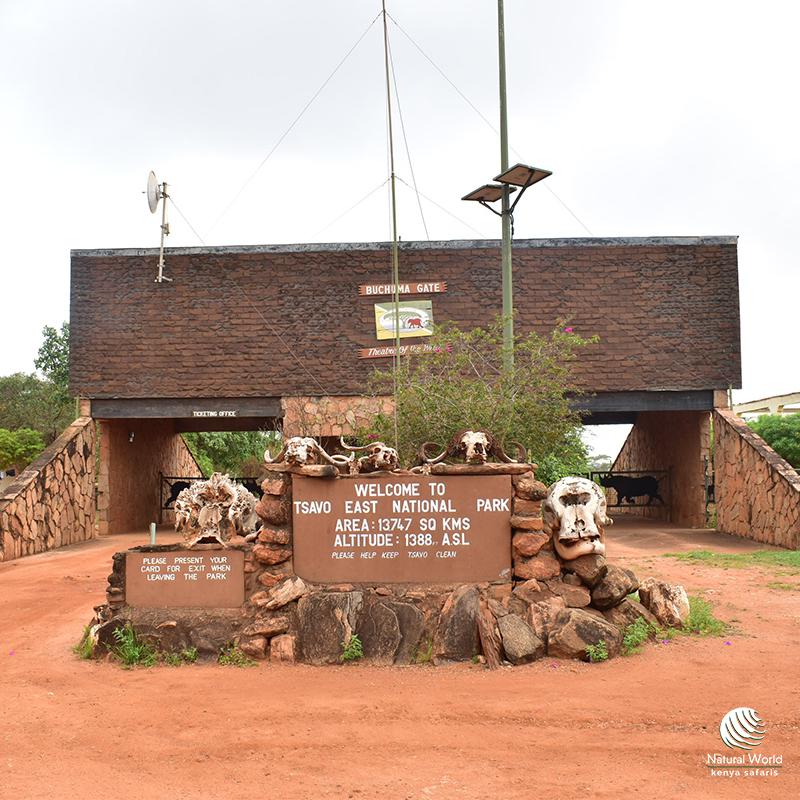 It is one of the planet’s last bio-diversity strongholds, the park features bushy grasslands, open plains, semi-arid acacia scrub abd woodlands. The tsavo east national park is open daily 6:00 am to 7:00 pm. No entry after 6:15 pm. No entry allowed at the Tsavo East national park on foot!. 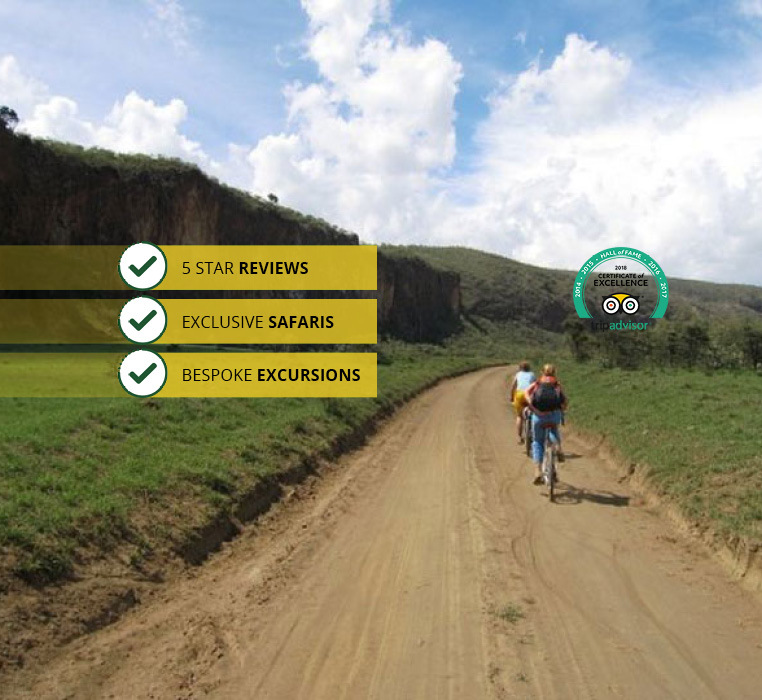 Walking and hiking only allowed in designated areas and in the company of a Kenya wildlife services ranger. Tsavo East lies to the east of the Nairobi – Mombasa highway, equi-distant between Nairobi and Mombasa and offers a vast and untapped arena of arid bush which is washed by the azure and emerald meanderings of the Galana River, guarded by the limitless lava reaches of the Yatta Plateau and patrolled by some of the largest elephant herds in Kenya. The sight of dust-red elephants wallowing, rolling and spraying each other with the midnight blue waters of the palm-shaded Galana River, is one of the most evocative images of Africa. The beautiful Aruba dam, located on the north bank of the seasonal Voi River, is visited by thousands of animals and makes a great game viewing destination. This whale-backed rock towers above a natural dam, which acts as a draw to hundreds of elephants. The longest lava flow in the world at 300 kilomtres in length, the heat-shimmering edge of the Yatta Plateau is the longest lava flow in the world and an ornithological paradise that attracts migrating birds from all over the world. Named after Captain Lugard, the first proconsul to East Africa, the falls feature a bizarrely eroded rock neck through which the waters of Galana River plunge into foaming rapids and crocodile infested pools. Tsavo east national park offers some of the most magnificient game drives in the world – vast herds of dust-red elephants, fat pods of hippo, giant crocodile and a kaleidoscope of bird life are set against a blazing backdrop of endless bush. Visiting the Tsavo East National Park and many more iconic locations, Natural world Kenya Safaris operates Kenya safari tours.